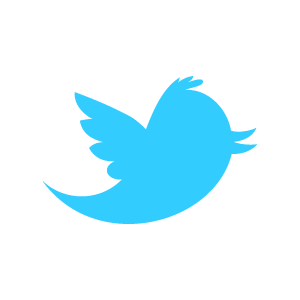 About Us - The Kashmir Company, Inc. The Kashmir Company was founded in San Francisco-Bay Area upon a desire to bring the centuries-old timeless Kashmiri art to the world. There are four concepts that represent the mission, vision and ultimate ambition of the company. These concepts underpin everything we do here at the Kashmir Company and can be expressed as desire to preserve the genius and unique skills of Kashmiri craftsmen, a passion to revive century old traditions of timeless Kashmiri art that can continue to thrive only with patronage, an obsession to conserve traditional skills that inflict minimal harm to the environment and a dream to make a difference in the lives and families of the people of Kashmir. The Kashmir Company is very passionate about reviving the centuries-old timeless art. The ultimate aim is to preserve traditional Kashmiri arts and market it all over the world—much like it was in the eighteenth and nineteenth centuries. This preservation will help maintain the legacy of the people of Kashmir as contributors to the artistic and cultural depth of the world. The designs, patterns and embroidery all help to define the rich artistic and cultural legacy of the Kashmiri people and so the Kashmir Company finds honour in helping to preserve this legacy and heritage. Timeless Kashmiri art keeps artisans and weavers employed and provides essential livelihood to their families. We believe that such revival of the art can transform the lives of the artisans in the Kashmir valley and we are committed to making that revival a reality. The ornate and beautifully embroidered shawls showcased through our online brands is a testament to the brilliance and genius of these artisans and so nothing drives our passion more than seeing them engaged and doing what they love doing the most—creating beautiful and timeless pieces of art. The great timeless art that adorn museums the world over would not have been possible without the dedicated effort of the thousands of artists, embroiderers, weavers and artisans who over the centuries have passed down the intricacies of timeless Kashmiri art throughout the generations. We want that baton passed on for more centuries to come and so our driving obsession is to help those people in Kashmir give their work the broadest audience and influence. The Kashmir Company strives to make a difference in the lives of the Kashmiri people and this mantra is embedded in everything we do as a company. The people of Kashmir have for a long time struggled to have their voices heard. We believe that by giving the art, skills and cultural heritage of the people a voice, we can help the people define themselves in the larger world. We are especially committed to helping the children of Kashmir and through our ‘Books for Kashmir’ non-profit arm; we are taking steps to making the children of Kashmir world citizens through education and personal development. Artisans too, form part of this dream and every timeless piece of art we sell helps an artisan to look after his family with dignity and pride. We strive continually to help enrich and empower the people of Kashmir and wouldn’t have it any other way. The Kashmir Company also believes in environmental sustainability and as such we incorporate both in substance and form, systems to promote the conservation of our environment. Each shawl is hand-dyed, hand-embroidered and hand-washed to preserve as much as possible a safe and natural manufacturing process. We’re also in the process of establishing dedicated goat and silk farms, these ensure that the materials sourced are of the highest quality. The Kashmir Company acts as the anchor for the overarching goals and ambitions outlined above but the vision is executed through our online brands. Presently there are two separate and distinct brands: Kashmir Seasons and Kashmir Dynasty. The Seasons Brand is The Kashmir Company’s Fashion Art brand. Kashmir Seasons was created to express the luxurious flair inherent in shawls and scarves made in Kashmir. It was also created with a desire to help the highly fashion-conscious woman move effortlessly from season to season with elegance, grace, charm and above all, class through timeless fashion art. 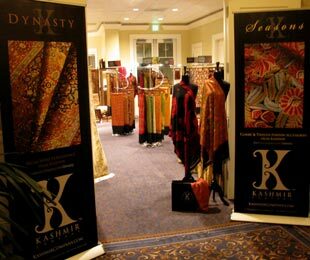 The Dynasty Brand is The Kashmir Company’s Home Decor Art brand. Kashmir Dynasty was created to bring the exquisite art and embroidery to Western décor and so Dynasty showcases the world’s best and most ornate home furnishings. Together both brands have helped to establish the Kashmir Company as the premier authority on the things that define quintessentially, the art and craft of the Kashmiri people. And ‘Books for Kashmir’, the non-profit organization we support takes the philanthropic lead in our overall vision for the people of Kashmir—especially the children. It is our hope that in time we’ll be able to establish fully functional libraries in various parts of the region so that the next generation of Kashmiri’s can take their place on the world stage as global citizens. The mission outlined above in conjunction with our unique and exquisite brands and products represent the essence of the Kashmir Company. We’ve sought to build and showcase this essence exclusively over the internet. We’ve done this for several reasons but the main thrust behind this approach is that we believe the internet presents the best medium for sharing the diverse, exquisite and timeless beauty of Kashmiri art and fashion. By focusing on the internet we are able to share this art with more people, in more places. Our journey has just begun and there’s a long way to go before we can say with certainty that timeless Kashmiri art and fashion is once again at the centre of Western fashion. We hope you’ll join us on this journey; we hope you’ll help us celebrate beauty, elegance, artistry and above all the love of the Kashmiri people. Welcome to our timeless world. Located in the San-Francisco Bay Area, we at Kashmir Company share an intense enthusiasm, excitement and zeal about what we have set out to do – preserve traditional Kashmir craftsmanship and make a difference in the lives of the artisans in order to preserve their unique skills. The last quarter of a century has been turbulent for Kashmir and its people and a resultant fall in patronage has forced Kashmir craftsmen to find alternate means of livelihood. The highly desired artistry of Kashmir craftsmen is at a decisive point in history and we want to make a difference. Kashmir Company founders have their origins in Kashmir, and generations of expertise in Kashmir’s rich indigenous art, thus elevating the vision of Kashmir Company from purely professional to a deeply personal commitment. Kashmir artisans, like all true artists, relate to their creations at an emotional and spiritual level, and every hand-made product in our collection captures and reflects that intensity and dedication of the craftsman who created them. 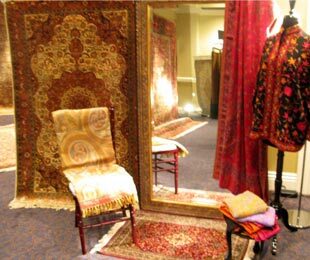 We at Kashmir Company intimately know each of our exquisite hand-made Kashmir products, and take great pride in acknowledging every single hand-knot in our exclusive silk rugs & carpets and every variation of color in our hand-embroidered wool and silk shawls and scarves. We at Kashmir Company have gone to great lengths to ensure we bring to our patrons the highest quality, most exquisite, one of a kind hand-made products from Kashmir through our Dynasty and Seasons brands. Providing an avenue for Kashmir artisans to showcase their art is just one aspect of our vision. The Kashmir Company supports fair trade, creates educational scholarships for school students and provides financial support to homes for displaced women and children in Kashmir. Your patronage and support will determine how far we can go with our dream to make a difference. Welcome to our world and our passion. We greatly appreciate you stopping by. The Kashmir Company was born out of a desire to preserve the genius and unique skills of Kashmiri craftsmen, a passion to revive century old traditions of ornately hand-knotted Kashmir carpets and exquisitely hand-embroidered and hand- woven shawls that can continue to thrive only with patronage, an obsession to conserve traditional skills that inflict minimal harm to the environment and a dream to make a difference in the lives and families of the people of Kashmir. For our esteemed clients, we aspire to provide a world class personalized online retail service through our online store and take delight in offering our patrons with the most distinctive, unique and exclusive products from Kashmir. We provide a world class buying experience that only the finest institutions provide and strive to constantly learn and improve on how our patrons like to be served. We want our exclusive patrons to know how important they are not just for Kashmir Company, but for the skilled craftsmen of Kashmir whose artistry they help preserve for future generations and for the children of Kashmir they will help educate for a better tomorrow.